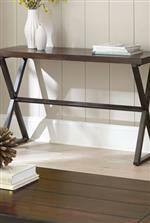 Enjoy a contemporary touch in your living space with this end table. This table boasts a stylish appearance with a minimalist touch. Its build incorporates hardwoods, birch veneers and metal for an elegant finish. 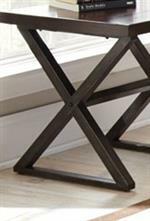 The Omaha End Table with Metal Base by Steve Silver at Walker's Furniture in the Spokane, Kennewick, Tri-Cities, Wenatchee, Coeur D’Alene, Yakima, Walla Walla, Umatilla, Moses Lake area. Product availability may vary. Contact us for the most current availability on this product. A charming combination of contemporary and industrial style is a promise with the Omaha collection. Tables are constructed of hardwood with birch veneer and a burnished dark cherry finish. The metal bases feature a hand painted liquid finish. Transform your living or dining room with the Omaha collection's authentic industrial look. The Omaha collection is a great option if you are looking for Industrial Contemporary furniture in the Spokane, Kennewick, Tri-Cities, Wenatchee, Coeur D’Alene, Yakima, Walla Walla, Umatilla, Moses Lake area. Browse other items in the Omaha collection from Walker's Furniture in the Spokane, Kennewick, Tri-Cities, Wenatchee, Coeur D’Alene, Yakima, Walla Walla, Umatilla, Moses Lake area.